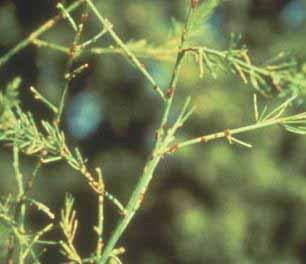 Rust diseases are among the most destructive of all plant diseases and asparagus rust - caused by the fungus Puccinia asparagi - can occur wherever the plant is grown causing early defoliation. If left uncontrolled this can result in a progressive loss of yield year after year. Although asparagus rust is not yet a major problem on commercial asparagus crops, it is becoming increasingly problematic on asparagus grown by the independent and hardworking private gardener – particularly on allotments. In fact, the risk of asparagus rust is taken so seriously that it is considered as a threat to asparagus production in this country - although it has yet to reach epidemic proportions. Symptoms: The first signs of infection will occur during the summer. This is recognised by the production of rust-coloured pustules, often in enormous numbers. which develop near the top of the feathery stems. This is followed by a darker brown streaking found lower down on the stems. In extreme cases this infection can cause the premature death of the entire stem. Unfortunately, plants affected by rust are also more susceptible to Fusarium crown and root rot. Treatment: Morning dew is important to the spread of this disease,especially during the summer months, so even before you plant out your asparagus beds cultural control must be one of the major deciding factor of whether you crop will be susceptible to this disease. 1. With this in mind, avoid damp and poorly ventilated sites for asparagus beds. 2. Plant your asparagus in well-spaced rows oriented in the direction of prevailing winds to maximize air movement and to help with the drying out soaked plants after rain. 3. Then, should your asparagus crop become infected, cut back and burn any feathery shoots that begin to show signs of infection. 4. 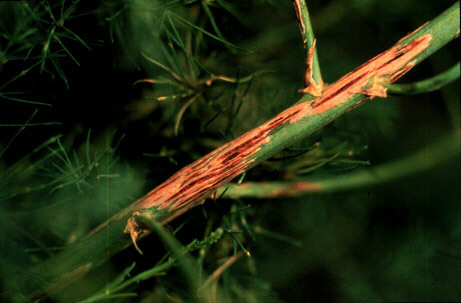 As an asparagus crop is not usually cut until its third year of production, avoid leaving plant debris around in young beds as this can allow the spores of the asparagus rust infection to build up in the soil. If this happens then next seasons young buds can become infected as they emerge from the soil. 5. Also consider planting rust-resistant varieties of asparagus, such as Jersey Giant or Martha Washington.